If you’re wanting to get a big discount on your AT&T UVerse internet and TV then Black Friday through Cyber Monday is the best time to save. You can find a variety of deals that include everything from $100 gift cards to even deeper discounts with bundles. Find all of the best deals we’ve found for 2018 so far below (updated regularly as we find new deals). $100 AT&T Gift Card + $50 Digital Fandango Gift Card – get a $100 AT&T gift card along with another $50 Fandago digital gift card when you sign up for select bundles that include AT&T internet along with TV or DirecTV. You can activate this deal and find more information by clicking the link provided. 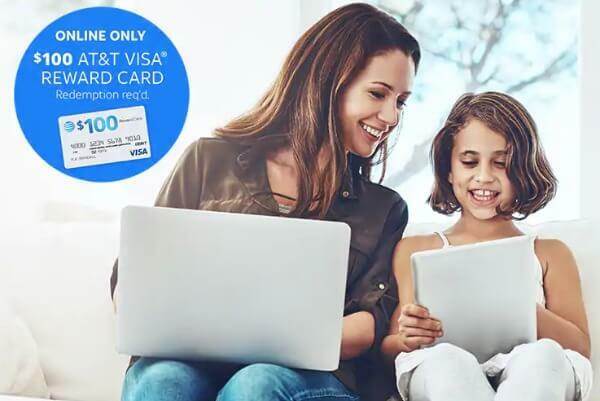 Instant $10 Off + Free Activation – during this sale you can get an instant $10 off discount and free activation when you purchase new AT&T internet services online. Packages Starting At $35 Per Month – take advantage of special promotional pricing during this sale to receive AT&T services starting as low as $35 per month for the first year. You’ll still be eligible for gift cards and other promotional gifts included with new service. You can also check out our AT&T internet and bundles page for more deals. Most of these special Black Friday and Cyber Monday sales still include other promotions offered by AT&T such as free HBO for three months and $100 digital gift cards. Almost all of the deals are for new customers and existing customers adding a new service. Leave any questions and comments about these deals below.